Frank Owen, left, regional sales manager of Jerry Pate, and Lee Higginbotham, Advanced Mower West, presented Barry Gladstone, center, with the SC2170 Chipper/Shredder. WEST FARGO, N.D.—ECHOBear Cat and its distributor, Jerry Pate Turf and Irrigation, have awarded Barry Gladstone of Maylene, Ala., with a new ECHO Bear Cat SC2170 Chipper/Shredder. 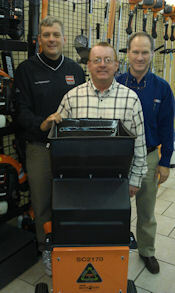 Gladstone was the winner of the giveaway at GIE + Expo 2012 in Louisville, Ky.
Jerry Pate Regional Sales Manager Frank Owen, along with Lee Higginbotham of Advanced Mower West in Birmingham, Ala., presented Gladstone with the SC2170 Chipper/Shredder. Owen spent some time going over the features and benefits of the SC2170 and the correct safety and operation procedures with Gladstone to ensure proper use of the machine. Gladstone says he was pleased to be the recipient of the SC2170 and is looking forward to putting the chipper/shredder to use with his landscape and lawn care business, Steven’s Wack-n-Sack, in Maylene. ECHO Bear Cat held the SC2170 Chipper/Shredder at the 2012 GIE + Expo from Oct. 24 – 26. Contestants registered for the giveaway by visiting the ECHO Bear Cat booth and presenting their official GIE + Expo name badge. The winner was picked at random.